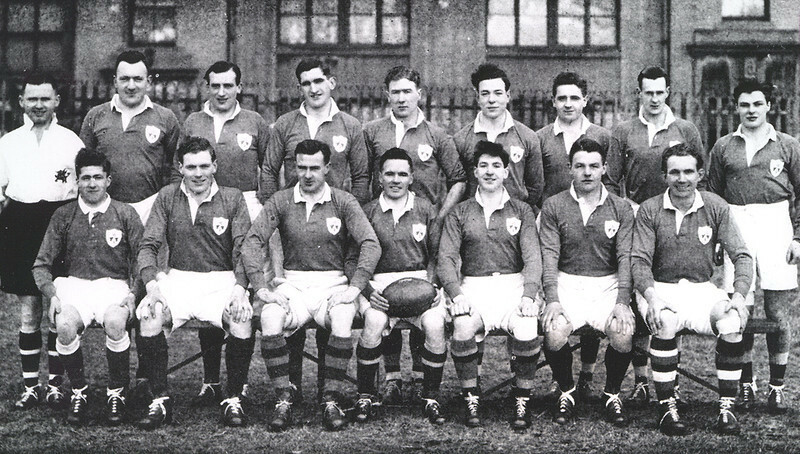 On 23 February 1946, Ireland played Scotland in Murrayfield. It is regarded by the IRFU as an unofficial international and no caps were awarded. Playing that day was Terry Coveney who had played his rugby with St Mary’s College RFC since leaving the Rathmines school. While other past pupils of St Mary’s College played for Ireland before 1946, they were capped as members of other clubs. Terry Coveney was the first St Mary’s College RFC member to wear an Irish shirt. On the day, Scotland won by 9 points (try, conversion and drop goal) to nil. The team is pictured below with each player wearing their club socks.